After a reflective evening and excellent first night’s sleep at the Waikoloa Beach Marriott Resort & Spa, I woke up ready to hit the road. I spent the morning at the South Kona Green Market, a small farmer’s market in the Kona area. I poked around and picked up a small breakfast consisting of a scone and the most delicious lilikoi juice ever, then I headed to Greenwell Farms for a tour. A few months ago I wrote about my coffee story. Drinking coffee from an early age, it is an integral part of my daily life. But only recently have I really begun to understand what goes into a really good cup of coffee. Of course, working in San Francisco, I am exposed to phenomenal coffee all over the city, but I really started to think about it more deeply with the opening of Coffee Cultures in the Financial District. Then during my recent AFAR Experiences trip to Seattle, I got to hear about the importance of buying high-quality green coffee from the experts at Caffé Vita. But it was only after an amazing afternoon at Greenwell Farms did the story come full circle for me. I had the unique pleasure of spending several hours with Tom Greenwell full-time coffee farmer, part-time mad food scientist, and all-around nice guy. I enjoyed my time immensely and highly recommend you visit the farm if you find yourself on the big island. 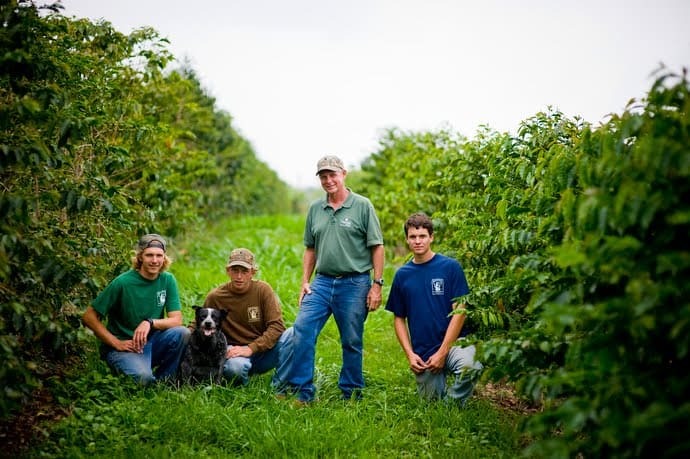 Tom is the fourth generation of Greenwells that have been growing coffee in the Kona Mountain region. 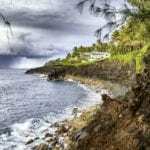 They are one of the oldest and most respected Kona coffee farms on the Big Island of Hawaii. The first Greenwell arrived and began buying land to produce coffee in 1850. 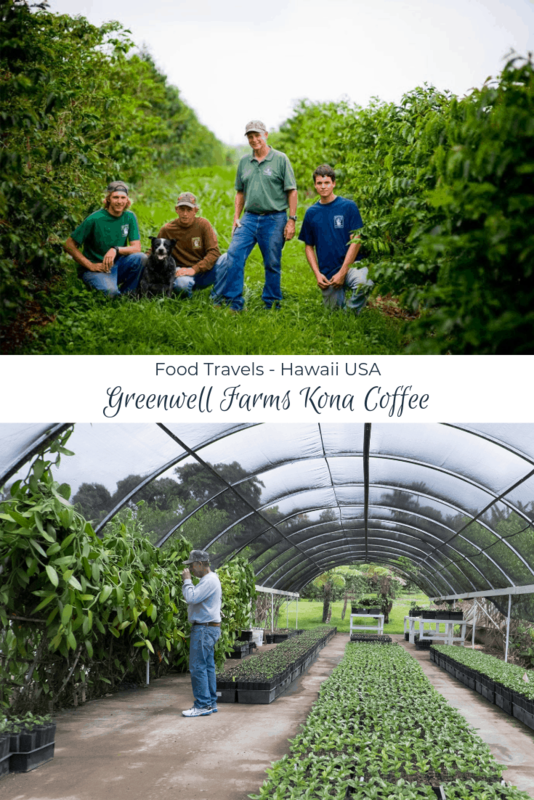 The coffee industry in Hawaii has gone through many phases with many cultural influences, but the Greenwell farm has been a mainstay on the island from the beginning. Henry Nicholas Greenwell was an entrepreneur and understood the concept of marketing your product and building awareness and demand. His coffee was awarded a certificate of excellence for best coffee at the World’s Fair in Vienna in 1873 and it was presented at the first World’s Fair in America which took place in Philadelphia in 1876. As you can see, they have been perfecting this for a while. Coffee is the reason why Tom gets up in the morning, literally and figuratively, but he is insatiably curious about growing and experimenting in general. 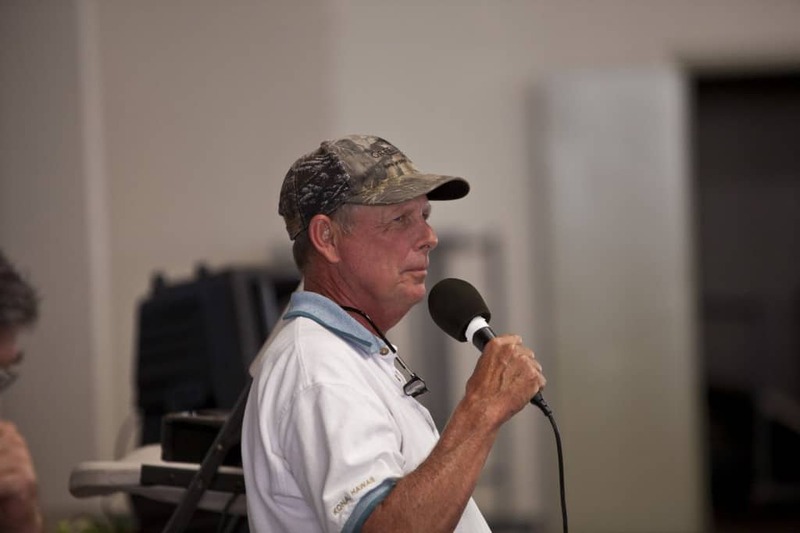 Farming was not his original life’s passion, but he definitely embraced it. He has built a farm with a unique variety of foods. 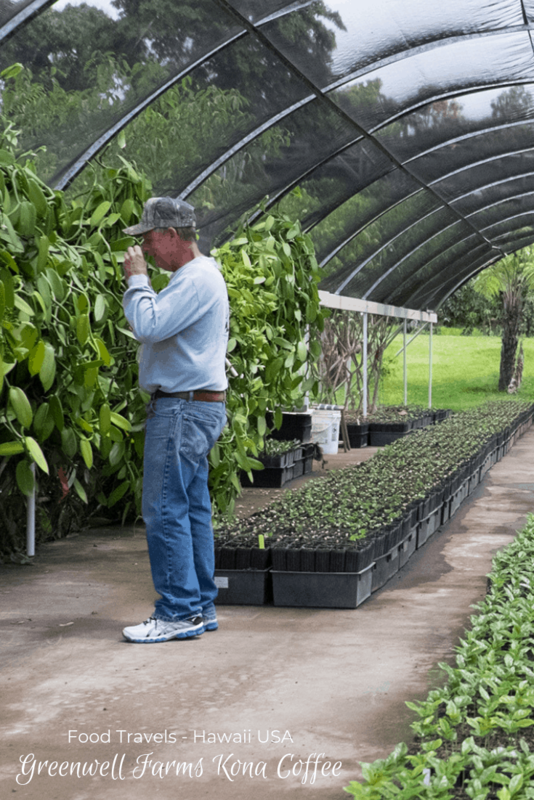 So while it is first and foremost a coffee farm, there are six different varieties of avocados, ones that had this California girl drooling as well as tons of citrus trees too. The more you talk to Tom and the deeper you walk on the farm, the more surprises you’ll find. Like peppercorns from Micronesia. Some of the experimenting comes from the fact that Tom is the only coffee farm in the world that has hired its own full-time biologist. Together they are exploring new varietals of coffee and other pursuits. He is also using every part of the coffee bean including the skins that go into a product called Kona Red which I tasted and loved. Greenwell Farms believes in educating as part of its ethos and they train farmers who sell their beans wholesale on producing quality beans, they train farmers producing in other parts of the islands, sharing their best practices. 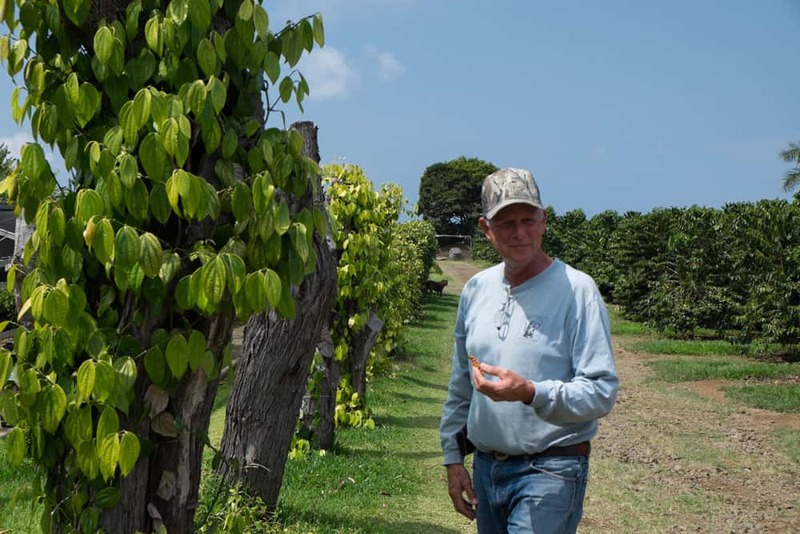 Tom wants to share his knowledge while gaining new insights that can allow the entire Hawaiian coffee industry to grow for generations to come. The coffee farm is a foodie’s dream. Along with oranges and other fruits, avocados, and peppercorns, there are vanilla and cacao beans as well. They have 5 acres of macadamia nut trees also. I spotted chickens. There are wild pigs. Nature has provided everything you need in one spot. It is such a stupid thing to say, but it wasn’t until I was standing on this farm that I ever thought about what having a farm could really bring. Tom Greenwell checking out his vanilla plants. A farm is an ecosystem on its own, it is self-sustaining, a little microcosm. But for most, it is much more than that, because farms nourish the world. Whether it is through the food they produce, the ingredients they harvest that goes into something on your plate, or the cup of magical elixir that wakes you up in the morning, farmers are contributing to the community. It is a theme I would see over and over during my week in Hawaii. The Greenwells have been providing a community in more ways than one. It turns out there aren’t a lot of places for kids to be kids. So while Tom’s children were growing up, if the baseball team a place to practice, Greenwell Farms supplied it. If there was a need for motorcross trails, Greenwell Farms created some on their property. Tom’s only rule…”no funny business.” Meaning a safe drug-and-alcohol free zone for kids to just be kids. 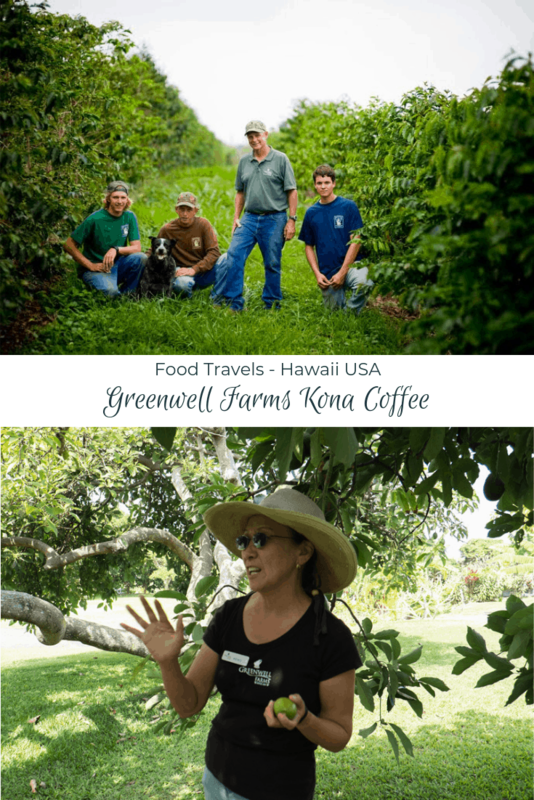 Greenwell Farms sells there coffee to some big names, but for direct to the consumer it’s only sold in Hawaii but is available on their website. They roast their coffee three times a week and goes roast to your house in three days. Their coffee club is very popular and a great way to always have some on hand. I tasted several of their offerings and there wasn’t one I didn’t like. So much so that I couldn’t imagine not drinking them black, no need for cream and sugar, so smooth and tasty you don’t need it. Tours run daily [for FREE] from 8-5 by a fabulous (and super friendly) team of folks, knowledgeable and passionate about the farm. If you visit their Yelp reviews you will see time and time again mentions of how warm and friendly the staff here are, with no pressure sales tactics. If you are extra lucky you may see Tom out and about on the farm with Buster and Lola, Greenwell Farm mascots and constant companions. Buster even decided to take a nap on my foot! Visit the Greenwell Farms website to learn more. How about you? 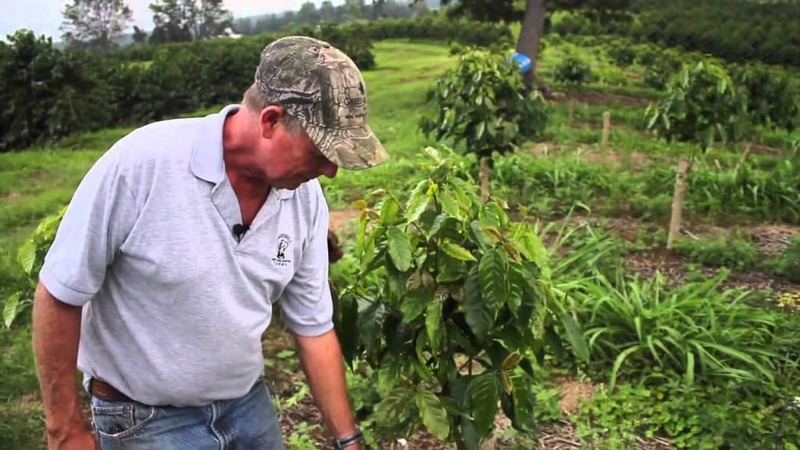 Have you visited a coffee farm before? My visit to Hawaii was courtesy of the Hawaii Visitors and Convention Bureau, my visit (as all are visits to Greenwell Farms) was free. As always, all opinions are my own. 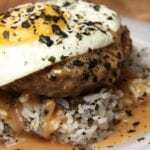 You can also view more of my trip to the Big Island in my Big Island of Hawaii for Foodies Wanderlist on AFAR. OMG take me there now!!!!!!!! Wow sounds like a fabulous family, farm and day trip! @Kayli, it was great. So nice to visit more than beaches. Hawaii has so much to offer! Hawaii is one of the most beautiful sights I’ve ever seen. 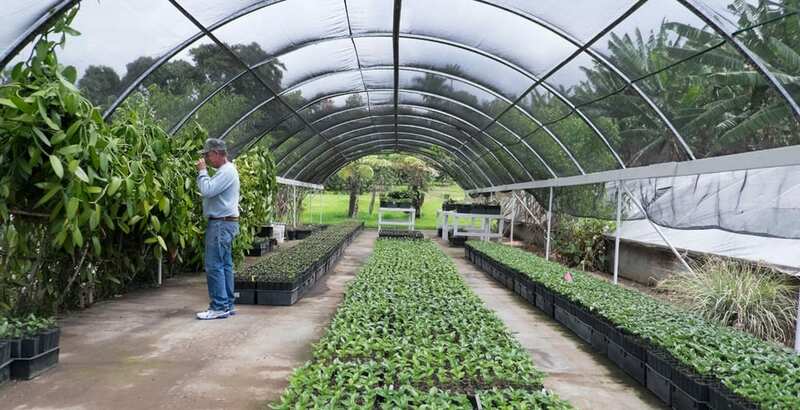 I’ve never been to a coffee farm before but it’s definitely going on my bucket list. @Betsy, what island did you visit? Cool experience.. i have never seen anything in their natural states either. @Fi, what part are you interested in visiting? What a neat experience that must have been. I would have been fascinated. I cannot wait until my Husband and I go to Kona. Eventually he wants to qualify for the Ironman Triathlon at Kona – I cannot imagine how beautiful it would be there. @Nancy, it is really cool, they have a fun farmer’s market as well. Good grief…that is amazing! Buster may be the luckiest dog on Earth! What a fantastic experience! Thanks for sharing it. @Heather, what island are you looking at going to? This is SO neat! Thanks for sharing these awesome pictures! @Cindy, you would love the fruits they have available on the farm! I have fond memories from our Hawaii trip. This is a great overview of a farm! @Activities, given the fact that you call yourself Activities Children, I am thinking that this spot is perfect for you. Ooh we are going to Hawaii in Feb next year! I’m not a coffee drinker but my partner is, we will have to try and make it here! @Ananda, what islands have you been to? There are great farms on the Big Island and Maui, I need to see farms on other islands! I love coffee so much! It is such a beautiful thing to see where it comes from first hand! @Amy, me too and it was awesome! I would love to take a visit to Hawaii one day! What a beautiful place. @TouristMeetsTraveler, what island are you interested in? How vast is the farmland? Wow, it has been buying land to produce coffee for over a century! It’s also my dream to visit a coffee farm like that. If other people would want to come, how much do they usually charge for the entrance/ tour? @Rochkirstin, the property is big! And the tours are FREE! What an amazing opportunity. I’d love to see a coffee farm up close and personally like you did. I’d especially love to see this one. The owner is doing some amazing things there! @Myrah, it is a fantastic place and Tom and his family are dedicated to coffee, farming, Hawaii and family. It great place to visit! What a great place to visit I have always wanted to go to Hawaii. I bet it was really neat checking out the coffee farm. I love coffee so I would enjoy it. @Catherine, I hope you get there some day! That’s an amazing sight! I hope to see Hawaii’s Greenwell Farms too! I would love to go there some day – it’s in my top ten for sure! How interesting! I love seeing behind the scenes of places like this. I think it’s SO cool that he has a biologist. @Melanie, he is a Renaissance man interested in so many things, it is fascinating! Kona coffee is the best. This looks like a fun side trip. @Lori, it is delicious! Love Kona ice cream too! I would have never imagined that peppercorns were so large! I thought they were seeds! @Jon, I know! I was pretty amazed by them! @Camille, thanks, I know a lot of people love the islands for the beaches, but there are a lot of fun non-beach things to do. How cool! That sounds like a super fun and awesome trip! I need to visit this place PRONTO! @Laura, are you planning to go to Hawaii soon or are you already in the islands? Such a fun and informative post. I’d love to trek over to Hawaii and visit a coffee farm. I’d also love to see a vanilla orchid in person but that’s a different story. @Michelle me too! I saw a great documentary on Tahitian vanilla. I’ve been to Tahiti but never had the opportunity to see a farm, missed out! Tom sounds like an amazing giver. Greenwell Farms Coffee is going on my stocking stuffer list. I loved hearing about how he is giving back to his community. @NJ, Tom is incredible you could spend hours talking to him about the islands, farming coffee history, he is full of history and stories! This is really fascinating! 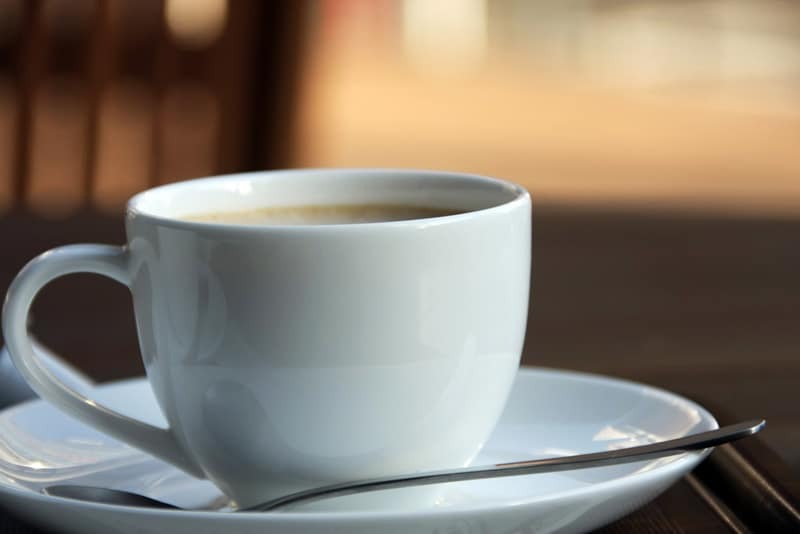 I’ve never really thought much about coffee even though it brings such a huge income to people all over the world. I’m not a huge drinker of the stuff, I like it in frappuccinos mainly! Great post and so thoroughly in depth! @Katie, I am glad you enjoyed it. There is still coffee in that frap! What a beautiful place to visit! I’ve been wanting to visit Hawaii for SO long and this is just another reason why. I love Kona coffee, too, which makes it even better. @Ashley, if you love Kona coffee you MUST go to Hawaii and visit Kona! Looks like a wonderful farm. I’m sure you enjoyed your visit. Looks fun! @Michele, I did and can’t wait to go back! What a lovely, interesting place and what a great time you obviously had! Great article. @Lisa, it was a lot of fun and it is a great team and great family! My boyfriend is a complete SF coffee snob, going so far as to pour out a cup of coffee I made because I had used old whole beans to make it. (old here meaning two weeks since we bought the bag) I think maybe he’d enjoy hitting a farm like that and seeing what goes into it! @Brenda, you got to love the purists, it is definitely something we discuss in my office. There are so many options in San Francisco, it is easy to be a snob. @Myrabev, do you drink tea? I think it would interesting to visit a tea farm as well, have you been to one? This is such a cool writeup, and those peppercorns are beautiful. I feel like I’m a bit of a coffee snob but it’s only because I love a good cup! @Jessica, I think it is good to be a snob, there is a huge difference in quality in coffee, I can’t drink low quality, it burns my stomach. What was interesting was that Tom is a purist, so no cream or sugar, and I like a good latte as well as espresso! Those pictures are beautiful and that farm looks amazing!! LOVE coffee, pretty much an addict. @Breanna, the farm is fantastic and the family running it is pretty amazing. Wow your trip looks awesome. I’ve never been to a coffee farm. @Karissa, thanks it was really interesting to see the process. What a great trip. I used to live in Hawaii and my favorite pass time was the Dole Pineapple factory. This looks like an amazing experience for you. this is totally up my alley…i did something similar when visiting Panama, but it wasn’t as in depth…it was a really tiny operation. Love learning anything about coffee! @Ruthy,it was my first time being at one, so now I might be spoiled. I lived in Panama for four years when I was a child, but don’t think I visited a coffee farm. You can tell high quality beans from those that are not. I was a barista and I knew it right from the smell. I’d like to be able to visit Greenwell farms!!! @Jo, oh I hope you do, how cool it would be as you have that barista experience! Coffee is definitely something that’s a MUST have necessity in my life. Cool that you took us into some of the inner-workings of the coffee process. @JoAnna, coffee is essential for me too! Glad you enjoyed it. I can’t say I have ever visited a coffee farm before. This sounds like such a great experience, though! @Carly, it was really interesting to see the process. I have a new appreciation for the product. That’s so neat that he uses every part of the coffee bean. He certainly doesn’t rest and relax with the status quo, does he? @Andi…it’s so funny that you think I care…I JUST WANT TO BE THERE…ANYWHERE 😉 Ha ha ha…seriously though, my husband has been promising to take me to Hawaii for like 5 years now…something ALWAYS comes up. (Most recently, he was going to take me for my 35th birthday, but then I got pregnant and am due the week before…ha ha.) I’m afraid I’ll never get there! @Heather, you will! It took my parents a long time to get there, the first time I went I was 18, they want to go back too. 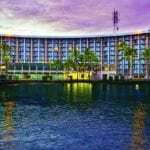 I am 44 and they haven’t been back since, but it is a great place for families so when your newest little one is travel ready maybe you can go all together. Like you, I am all about some coffee. Thanks for introducing me to Greenwell Farms! @Dawn,my pleasure! They do mail order too! I have never been to any coffee farm before. I would love to visit there some day . Thanks for sharing. This is right up my alley. As a professional cook and coffee lover, I really appreciate the time, passion and dedication people have when it comes to ingredients and such. I personally love roasting my own coffee beans and depending on the type of coffee, where it’s from, how it’s roasted, I will make sure my water is at the precise temperature for brewing. Now, this isn’t an every day thing, but it is a little hobby of mine (with tea too). @Amby, I love the dedication to the art of drinking the coffee in its most optimal way. This sounds like such a fun day trip. I wish I could visit. @Jessica, you can, if you ever get to Hawaii, add to your plans, its free! What a beautiful place. Gorgeous pictures! So jealous you got to experience this. Hopefully someday I will be able to go as well. What an amazing trip! Hawaii is really doing some amazing things in agriculture – I have a friend who is starting his own cacao farm there. Hope that food tourism will continue to grow in Hawaii! 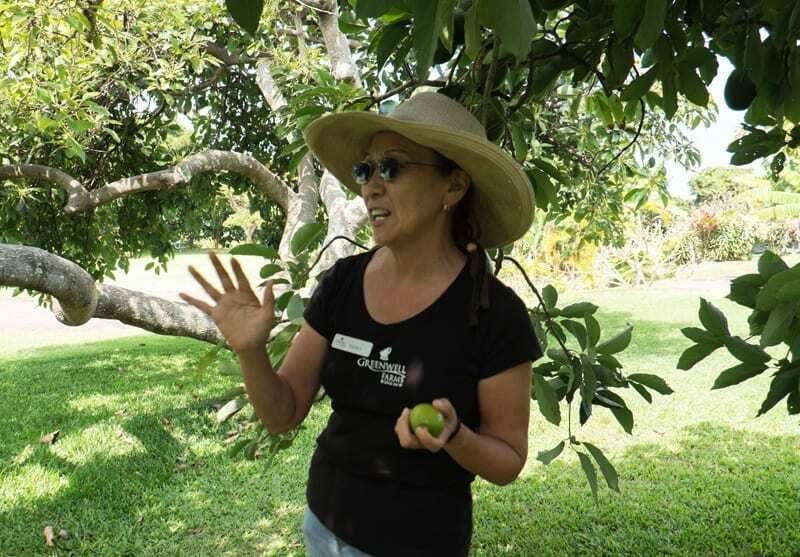 @Anita, there is so much new farming happening on the Big Island it is going to be interesting to watch the next couple of years. sounds like a wonderful trip to match wonderful pictures. I don’t drink coffee, but I sure do love the smell of it! @Alyssa, oh the smell! It’s the best part! This is a really cool experience and honestly until i started reading never thought about what goes into a farm or a farm like this one. How did the coffee skins coffee taste and does the skin have caffeine. sill question but I wondered if it was more flavor than caffeine. @Liv, I know it is really interesting to peek inside where ordinary things that are a major part of our lives are grown! Excellent blog! Looks like you farmers know your stuff about coffee. Truly dedicated and hard workers farmers are! Funny story, when we got there we realized my 4 year old didnt have shoes. I thought husband grabbed them, he thought I grabbed them… BUT we realized no biggie, its Hawaii!